She calls her work “poetic film art” and one could add: “...with a twist”. 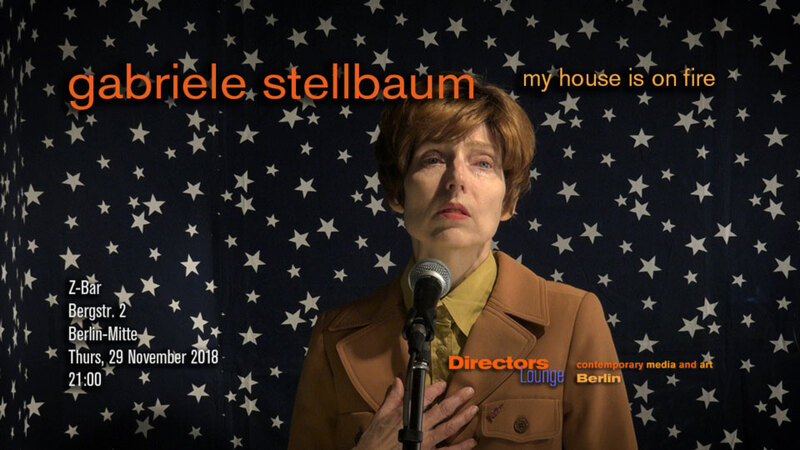 Stellbaum often works with a single, or only a few characters on simple settings, mostly in locations in Berlin or in her studio. However, what starts like a story of a narrative short film, does not progress the usual way. The poetry of the scenes and the dialogues (sometimes a monologue) is rough, sometimes disturbing, and reminds of Beckett and Brecht. The dramatic conflict of the pieces, at the same time, remains unresolved, and the missing culmination point creates a rather flat open-ended dramaturgy. The artist tells me about a breathing technique, which Beckett required from the actors in some of his plays: They were asked to articulate his rather long sentences in one breath, bringing the actors almost to exhaustion or fading. Stellbaum characters often seem to suffer from a similar breathlessness caused by circumstances beyond their control, circumstances as groundless as the accusations of Kafka's judges at the castle. In “Heretofore” (2017) the artist appears as main protagonist in her video, like in other pieces. A short glimpse, a slightly wider shot, shows, what the reverb of the sound already has revealed: she stands in a small box behind a window and that frames her upper body incorporating (however not fully convincingly) the kind of political speaker we would expect for candidates for judges or senate. The box is decorated with a wallpaper of five-edged stars. She, the performer, does not try to immerse the viewer into a Hollywood realism. It is the language, however, that creates the illusion of real speech. “Undoing the Linear” (2017) is quite different in comparison with most of Stellbaum's more recent work. The setting may remind of a late Beckett piece. Located in an old Berlin ballroom, the field of view of the camera has been marked with tape as a virtual rectangle on screen, and the performer strictly moves only along the marks, or inside the marked space. However, it quickly becomes clear that the action, or performance, does not lead into the heavy existential narrative of a Beckett play. Instead, it is centered on the sound. The performance becomes a duet between the artist and the piano. A more typical Stellbaum piece is „Close Huddle“ (2017). An empty Berlin pre-World War II tenement with worn, old-fashioned wall paper but with freshly painted double-winged windows is the background for a kind of chamber theatre piece with two women wearing the same non-specific beige dress. The two women converse within and about an internal shared space that they seem to have created for themselves, without being friends. The dialogue lingers on reflections about closeness and sharing, without creating a warm or more friendly feeling between each other. Close Huddle is unsettling without drama or obvious reason. The two women seem to reasonably discuss grounds for becoming connected with each other or the outside, but the discourse disperses into individual anxiety. Stellbaum's films are sometimes funny in a wicked way, and sometimes subversively unsettling. She mostly leaves it open to the viewer to find direct references to society or politics. It will be an intense night to view and to discuss the films. As usually she will be present for Q&A.